They say, according to the fossil record, that humans (scientific genus Homo that includes erectus, halibus, and sapien) have been using stone tools for 2.3 MILLION years. This was our first advancement in technology out side of ourselves in the form of up-right walking in order to see over tall grasses to look out for resources and predators. They also say that we were not able to control fire until up to 125,000 years ago. Modern humans as we look today are about 200,000 years old. So doing the math, we have been making use of stone tools for a very a loooong time. Some tools have not changed much in function or form, chief of these are fire, cordage, and the blade - or a sharp edge of some kind. They say that we started to use cordage to make clothing and baskets about 77,000 years ago. Fire being earlier than that at 800,000 years ago, and the use of stone tools being more than 2.3 million years ago! Having an edge really gives one an...edge, so to speak, when needed for survival; creation of other tools, harvesting of food - and a huge aid in hunting, and self/group protection. A blade or sharp edge can be made of stone, bone, or shell. In our modern world one can also be made of metal, plastic, and glass. The abilities of fore-thought, reasoning, and improvisation is one of the main factors in our survival as a species. Improvisation is a key ability that allows us to stand apart from other animals on our planet. Recently, I gave a small workshop on how to make some stone tools. The goal was to strengthen the seed of improvisation by stretching the mind to think outside of the box with the ability to create a tool that could save a life from seemingly useless material. We worked on creating a stone flake from a large cobble of chert. Chert is a by-product of limestone that has a large amount of silica in it. 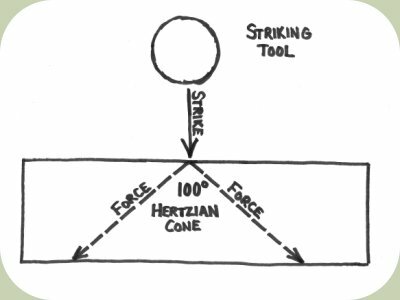 When struck in a certain way stone rich in silica creates what is called a Hertzian Cone; this is a fracture that is seen when plate glass is struck with a round object such as a pebble or BB from a BB gun. The Hertzian Cone is what allows us to predicatbly take of mass from silica rich material such as, obsidian, keokuk, chert, flint, porceline, and especially glass.In fact on a hardness scale 10 being the highest, diamonds are 10, glass is 5, and our fingernails are a 3. Being able to "chip" off predictibale flakes and reduce mass from stone is callked Flint Knapping, meaning flint-working. This process of mass reduction to create a shape or an edge is how arrowheads, and spear points are produced. However, as romantic as creating a nice semetrical sharp arrowhead is, it takes a lot of time and practice to produce one. Something that ancient peoples had a lot of - time. But, the practicality of the matter is that there was little time to create a nice looking work of art when the tribe was starving. So the ability to create a suitable working point or edge was many times just enough to harvest or make the resources needed. Only after the necessities of warmth, food, and shelter were taken care of did ancient peoples have or make the time to create works of art. So with that in mind, I wanted to take the group through the basic of basic steps to create a point, and this was by first creating a spall or a flake from a larger flake or cobble of stone. This is done by finding or creating a platform on which to strike using another rock known as a hammerstone at a less than 90-degree angle, or an antler mallet called a billet from moose, elk, or deer, or even a piece of copper. A platform is created by using percussion flaking, or hitting the main stone with your hammer stone to produce a flake. This flake that is created depending on the platform struck and the amount of force used to strike off the flake can be used, just as-is. In many cases it is very, very, razor sharp. In fact the edge of an obsidian flake smooth with no serrations even after being maginified 10,000 times! 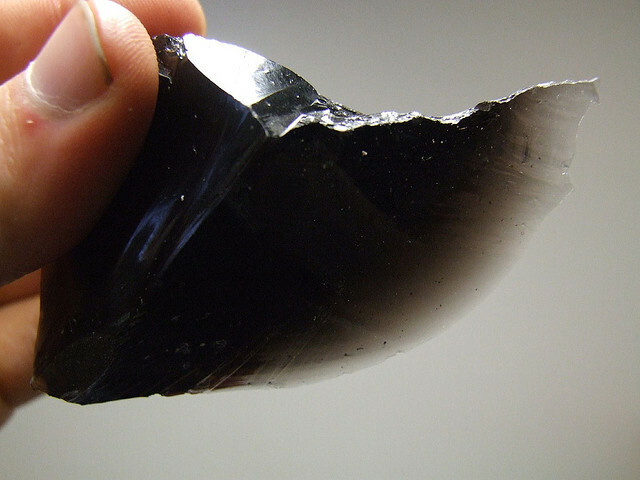 Obsidian flakes are often used in micro-surgery. Obsidian has been used experimentally for blades in surgery, as well-crafted obsidian blades have a cutting edge many times sharper than high-quality steel surgical scalpels, the cutting edge of the blade being only about 3 nanometers thick.Even the sharpest metal knife has a jagged, irregular blade when viewed under a strong enough microscope; when examined even under an electron microscope an obsidian blade is still smooth and even. One study found that obsidian incisions produced narrower scars, fewer inflammatory cells, and less granulation tissue in a group of rats. Once you have a flake you essentially have a very fine edge that can be used in a multitude of ways. Including skinning and butchering large game such as deer. When the edge becomes dull you simply discard the worn flake and break off another one from your main cobble now called a blade-core. To increase dexterity and leaverage with the flake blade it can be hafted or fixed onto a wood handle. This is where knowlege of cordage comes in. The subject of cordage making and use is outside the scope of this article but there more on this subject to come. Stay tuned!